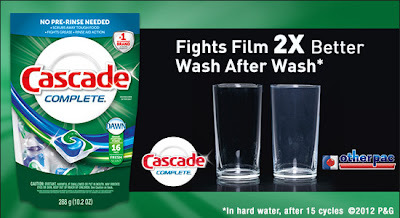 Being Frugal and Making It Work: Cascade Complete Pacs: Get a “Sparkling Clean in 2013”! I also love the ease and convenience that Cascade Complete Pacs allow. Just drop one into the dishwasher compartment and you're done! It's so easy that anyone can do it... children of all ages (a great way for them to help Mommy), and even the husband! Get sparkling clean in 2013, and set the table with virtually spot-free glasses and dishes at every meal by using Cascade Complete Pacs. They provide an immaculate clean without wasting precious time (and money) and water pre-rinsing 24-hour stuck-on food messes. Over time, Cascade Complete Pacs fight hard water film two-times better, wash after wash, than the next leading premium pac. About Cascade: In 1953, Cascade entered the automatic dishwashing market with claims of “spotless dishes” to the 4% of households with dishwashers. This fast-moving world of household innovations was just in its beginning stages, and Cascade stayed at the forefront for the next 50 years by developing a range of automatic dishwashing products perfect for a variety of families, needs, and lifestyles. Today, with decades of experience and dishwashers in more than 60% of households, Cascade continues to grow, striving for immaculate dishes every time with its brilliant automatic dishwashing powders, gels, pacs, and additives. This blog post is part of a paid SocialMoms and Cascade blogging program, and I received free product from P&G for participating. The opinions and ideas expressed here are my own.